You could say that a minute and half during the first period of Friday night's Pens/Islanders matchup at Consol Energy Centre was the difference between a great night and a slightly disappointing one. In that 95-second span, the Penguins watched an early 1-0 lead transform into a 3-1 deficit against one of the Metropolitan Division's up and coming teams. Saturday night offered the Pens a chance to redeem that 95-second lapse which resulted in Friday's 5-4 shootout loss. Going into the game, all expectations were that this would be a physical game. The chippy play that resulted in only 6 penalty minutes outside of the obligatory 5-minute fighting majors earned by Robert Bortuzzo and the Islanders' Matt Martin left tensions high leading into the second game of the home-home series. This game started out as physical as one would have expected. At 15:24, Steve Downie would drop the gloves with Isles' agitator Tavis Hamonic, livening an already raucus crowd at Nassau Colliseum. Less than a minute later, Evgeni Malkin would score his eighth of the season beating goaltender Jaroslav Halak with a wrister to the short side. 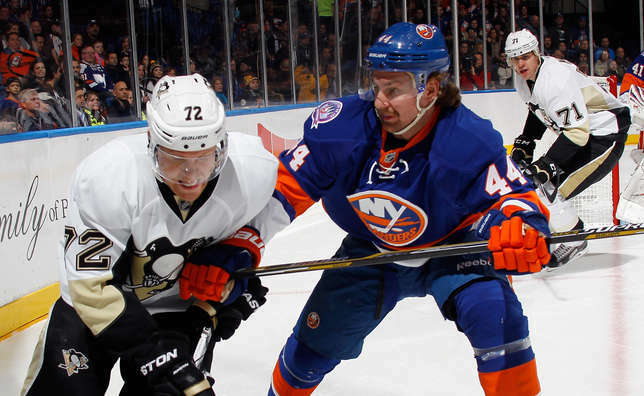 The goal was a gritty goal from beginning to end, the result of an aggressive forechecking effort from first Nick Spaling and then Patric Hornqvist before Geno was able to collect the puck and walk it in on Halak. A weak hooking call on Olli Maatta late in the period would ensure that the first would end with a score of Pens 1, Isles 0. The second period saw a motivated Islanders team take over. By the end of the second, Matt Martin tie up the game for the home team while bodies converged on Thomas Greiss. The tying goal came at 18:01. Unfortunately for the Pens' netminder, for most of the period, he was the best player on the ice for the Penguins as sloppy play reared its ugly head throughout the second. Errant passes - some bad, others just blind passes or the result of the team's tendency to want to be too fancy - nullified a number of quality rushes the team had into the defensive zone. "Making (rather not making) the extra pass" was not something that the two teams would have in common as the Islanders clearly dominated in the shot column during the second period, 7-13. The attempted shot totals were even more lopsided as the game total at the end of two were 46-27. Early in the third, Anders Lee continued to build the Islanders momentum tipping in a Lubomir Visnovsky shot from the point. But, seriously, the Pens got dominated in the third. 6-of-19 in the faceoff circle? Check. Not one, but two game misconducts? Check. Give up three goals total in the period? Check. Check. Check. Some nights are just not your night and, as good as Thomas Greiss was through two periods, the Pens didn't stand a chance in this one. The Penguins travel to Boston next to take on the injury-depleted Bruins. That game takes place Monday, Nov 24 at 7:00. Marc-Andre Fleury was given the night off and remains at 299 wins for his career. He is expected to start on Monday against the Bruins. Since entering the NHL in the 2003-04 season, Fleury is 11-6-3 against Boston in 21 regular season appearances. Despite giving up four goals on 35 shots, Thomas Greiss finished the game with a save percentage of .924 on the season so far. His career high for save percentage was last season's .920 over 25 games with the Phoenix/Arizona Coyotes. Patric Hornqvist added an assist to his point total on Evgeni Malkin's first period goal. The points put both players on pace for 99 points on the season. Hornqvist's highest season point total, achieved in the 2013-14 campaign with Nashville, was 53. Malkin has had three 100-plus point seasons.